Rapidly growing mycobacteria (RGM) are divided into six major groups including the two clinically most important groups, M. chelonae/M. abscessus complex and Mycobacterium fortuitum group. This chapter discusses infections associated with these groups with an emphasis on pulmonary disease. Phenotypic and molecular laboratory identification methods are reviewed as accurate organism identification is necessary for optimal RGM lung disease patient management. Antimicrobial susceptibility patterns for the most common pathogenic RGM species are discussed with an emphasis on the impact of inducible macrolide resistance found in many RGM species and subspecies. Because of antibiotic resistance, the RGM are frequently difficult to treat successfully. Current therapeutic approaches are reviewed with an emphasis on antibiotic options in the context of both innate and acquired antibiotic resistance. We humbly acknowledge and thank our patients with M. abscessus lung disease whose patience with their physicians, courage and strength are both boundless and inspirational. Choi H, Kim S-Y, Kim DH, Huh HJ, Ki C-S, Lee NY, Lee S-H, Shin S, Shin SJ, Daley CL, Koh W-J. 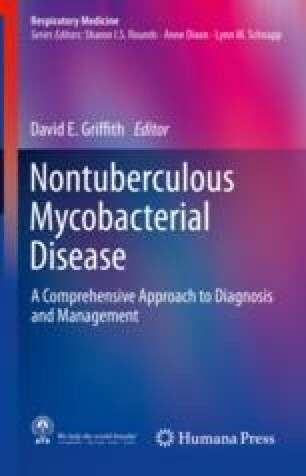 Clinical characteristics and treatment outcomes of patients with acquired macrolide-resistant Mycobacterium abscessus lung disease. Antimicrob Agents Chemother. 2017;61:e01146–17, https://doi.org/10.1128/AAC.01146–17.